Sgt. Willette Combs, center, takes the American flag from Staff Sgt. Amin Brimah, left, and Sgt. 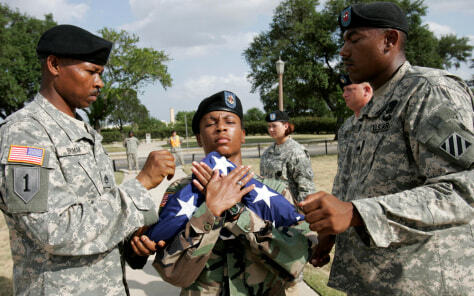 Blandon Green in a June 16 flag detail at Fort Sam Houston in San Antonio, Texas. The base hasn't been able to pay its utility bills due to a funding shortfall.